"Schniedewind and Sapon-Shevin knit together the stories of teachers, parents, scholars, and activists who have found imaginative ways to say no and "to act with courage and hope." "With this earnest compilation of essays and exposés, teachers and activists Schniedewind (Open Minds to Equality) and Sapon-Shevin (Because We Can Change the World) aim impassioned, statistic-tipped arrows at the political and corporate forces responsible for endangering the American public education system, and encourage readers to learn more about these forces. Through themes of disbelief, outrage, cooperative resistance, and activism, the authors introduce firsthand accounts from educators, parents, lawmakers, and students. The book sheds new light on this 'ambush of public education' and the opportunities for poor students living in at-risk school districts, seen here as direct results of dysfunctional policies and institutions (No Child Left Behind, Race to the Top, Teach for America, corporate-funded charter schools) supposedly designed to integrate a socially just system for students and teachers. Standout contributors include a master's degree candidate who had been denied her high school diploma because of a lone failing test score, and a public school teacher who, in a moment of hopelessness, accidentally became the leader of a grassroots campaign for reform. Though there's much to bemoan about the current state of public education, we also learn there's much that can be done." From the Introduction This book is a chronicle of courage, hope, and inspiration. It offers the voices of those who are resisting legislation, policies, and practices that are inconsistent with a democratic vision of education and society. Rather than simply lamenting what is happening in our schools, these people are actively finding ways to foster educational equity for all in the face of significant odds. Educational reformer Deborah Meier says, “Resistance to nonsense is one of the greatest powers of human beings.” The sound bites about “school reform” that we hear on the news are deceptive; the voices in this book are the real, seldom-heard accounts of those on the ground making a difference. Charts and graphs cannot tell us what it is like to teach in a kindergarten that has eliminated play, or what it is like to be forced to administer tests that you know your students cannot pass. It is through stories of the people who are in schools and communities that we can craft a picture of how education is being undermined and of how courageous people can make a difference. This book tells stories of educators, parents, students, and community members who are individually and collectively fighting for public education that affirms young people and works for the common good. The voices here represent hundreds of thousands of others who continue to protest the policies that have damaged millions of young people and that have the potential to destroy public education. We hope this book encourages those who value public education to speak up and push policymakers in democratic directions. We hope readers will be able to envision and support alternatives to what is and work to transform current educational and other social policies and practices into those that nourish all young people. The purpose of public education in a democracy is to provide a meaningful, challenging, and equitable education for all students, one that sets high academic expectations without regard to race, class, gender, family of origin, or language. Equally important is that students learn to participate in a democratic society and work with people different from themselves. We imagine schools in which students view one another as vital resources and understand that a successful society is one in which no person is discarded or disenfranchised. We work for diverse, inclusive school environments where thoughtfulness, care, and cooperation help prepare students to be critical thinkers, problem solvers, and active participants in their local and broader communities. Educational policies driven by market concerns ambush the possibility for this kind of democratic education. High-stakes testing, voucher programs, corporate-connected charter schools, test-driven teacher evaluation, merit pay, mayoral control, and national standards put private corporations at the helm of education, rather than the public. Our educational system is being privatized and, in the process, our democracy is threatened. 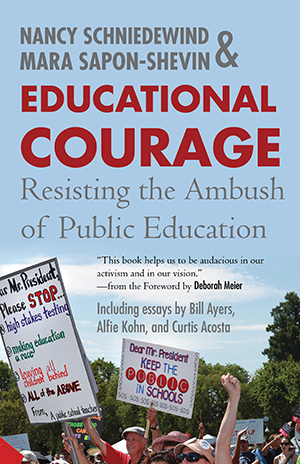 The Educational Courage of Resisters This book describes the reality of public schools and presents the stories of those who have had the courage to resist market-driven policies and practices from the initiation of No Child Left Behind (NCLB) in 2002 to 2011. The voices in the book reflect different kinds of resistance, with people saying no in a variety of ways. While some spend their energy working within the system to provide meaningful education for young people, others concurrently take actions to resist them. Still others focus their energy on organizing collective activity to challenge ambushing practices at the local, state, and national levels. Many integrate all these approaches. Part I, “Is This What We Call Education’” includes a history of the current ambush of public education and the effects of ill-considered federal legislation on young people, educators, parents, and communities. A teacher and parent describe what has happened to their teaching and to young people because of these policies and courageously dissent in a time characterized by conformity and fear. These accounts can help raise consciousness about the reality of schools today, a necessary place to start a movement for change. The voices in part II, “ I Won’t Be a Part of This!’--Educators, Parents, Students, and Community Members Resist,” represent many thousands of other people across the country who, as individuals and small groups, have resisted the current, top-down educational agenda. Some resist by writing op-ed pieces; some publicly say no by refusing to take a test or resigning from a charter school that has “gone corporate.” Others resist by organizing neighbors to change testing policies detrimental to English-language learners. By refusing to be silent, this group of writers gives courage to others who may think about similar actions. “Resisting by Working in the Cracks’--Creating Spaces to Teach Authentically,” part III, describes how educators, even when constrained, create space within the current system to teach authentically. Committed to developing students’ intellectual, social, and emotional learning, they explain how they foster socially just classrooms and schools and keep their teaching vibrant and curriculum relevant despite test-driven constraints. An encouraging account from one public alternative school, included on the Educational Courage website (www.beacon.org/educationalcourage), shows that “choice” for students and families is possible without the privatizing demands of charter schools. These stories of creativity, resilience, and perseverance will inspire other educators to find the cracks in their own educational settings where they can teach with young people at the center. “Not My Voice Alone’--Organizing to Reclaim Public Education,” part IV, presents ways in which students, educators, parents, and community members have articulated alternative visions for public education and fought for meaningful change. Whether they’re resisting paying teachers for test scores, organizing against charter school takeovers, fighting mayoral control, or educating others about the dangers of a business model of education, these examples of organized, public resistance encourage others to reclaim a sense of urgency in fighting for public education. Contributors also describe the work of local and national organizations that have built coalitions for broader outreach and advocacy. Writers present a vision of ways we can act together toward progressive, multicultural, and democratic schools as we move into the future. Even more voices of resilience and courage are found on the Educational Courage website. Coordinated with the book sections, pieces there offer powerful stories from others who fight for public education. In addition, the Educational Courage website contains practical materials related to the narratives in the book. Fact sheets from the National Center for Fair and Open Testing (FairTest) and Parents United for Responsible Education (PURE), for example, provide excellent examples of materials that educate others. There are also resource lists of organizations and materials, a bibliography, and contributor biographies. The pieces in Educational Courage are organized by theme rather than chronologically. The sequence builds from understanding school realities, to stories of individual resistance, to accounts of meaningful teaching despite top-down constraints, and finally to narratives of organized, collective resistance. A chronology of the creeping assault on public education from the passage of NCLB in 2002 to 2011--”A Short History of the Ambush of Public Education”--introduces part I. A snapshot of the movement to protest against these policies, provided next, gives context to the voices of the resisters whose stories you’ll read in Educational Courage. A Decade of Educational Activism Ever since the ambush of public education began, there have been educators, parents, and students who have spoken up to protest these hurtful policies. While market-driven initiatives began to threaten public education during the Reagan administration, they became solidly institutionalized in federal educational policy with the passage of NCLB. While people have spoken out to counter these policies over the past thirty years, this book focuses on the decade since 2002. Well before NCLB, organizations and individuals were advocating for progressive, democratic education. Some like the North Dakota Study Group focused on building democratic classrooms and schools and critiqued narrow methods of accountability and assessments. Others like the National Coalition of Educational Activists, a multiracial organization of parents, teachers, child advocates, union, and community activists, connected educational advocacy to broader struggles for social justice, equality, and democracy in order to improve public education. Founded by Milwaukee teachers and parents in 1985, Rethinking Schools magazine became a voice not only for those doing meaningful social justice education in their schools, but for those resisting policies that undercut educational equity. Rethinking Schools continues to link classroom issues to policy concerns and chronicles the activism of teachers, parents, and students fighting for quality education for all children. Its superb books and curricula support educators working to enable students to achieve academically and act democratically. In the late 1990s, more resisters sounded the alarm about the dangers of standardizing education. Susan Ohanian wrote the influential One Size Fits Few: The Folly of Educational Standards in 1999 and has been writing about the dangers of testing and the privatization of public education ever since. In the same year, George N. Schmidt, a well-respected veteran teacher, was fired from his twenty-eight-year teaching job in Chicago when he published samples of the Chicago Academic Standards Examinations (CASE) in his journal Substance. He continues to critique the effects of harmful educational policies in Substance News. The National Center for Fair and Open Testing--FairTest--began its work to end the misuses and flaws of standardized testing and to ensure that evaluation of students, teachers, and schools is fair, open, valid, and educationally beneficial. FairTest continues to provide excellent information, technical assistance and advocacy on a broad range of testing concerns. After the passage of NCLB, awareness of the problems with standardized testing and federal control over educational policy began to grow. Parents, like those whose stories follow, fought the negative effects of testing on their children and schools all across the country throughout the decade. More recently, parent groups like Class Size Matters in New York City have fought overcrowding, corporate-connected charter schools, mayoral control, and the privatizing of education. In 2010, parent groups across the country joined together in Parents Across America in an effort to bring their voices into educational policymaking on national, as well as local and state levels. Teachers have organized in their unions to fight for progressive educational policies. Some formed caucuses within large city unions, such as in Los Angeles, to resist corporate charter takeovers of schools and standardized testing. The Caucus of Rank and File Educators (CORE) in Chicago won the 2010 election to lead the Chicago Teachers Union, and Bob Peterson, Rethinking Schools editor and advocate of social justice unionism, was elected president of the Milwaukee Teachers’ Education Association in 2011. Some groups like the Grassroots Education Movement (GEM) in New York City work both within and outside the larger teacher unions to educate and organize teachers, parents, students, and communities against corporate and government policies that underfund and privatize public schools. GEM produced the outstanding documentary, The Inconvenient Truth behind Waiting for Superman to further expose these policies. Teachers have formed progressive organizations in various areas across the country to give each other encouragement, to share teaching strategies that support social justice, and to fight policies that undermine public education. These teacher activist groups across the country also typically hold annual conferences in various cities. In his piece in Educational Courage, contributor Sam Coleman describes the way the New York Collective of Radical Educators (NYCoRE) supported his successful school-based effort to resist merit pay. Throughout the past decade, numerous educators have written about the impending threat to public education. Among them are longtime democratic educator Deborah Meier and Diane Ravitch, former assistant secretary of education, whose dialogue, “Bridging Differences,” has been published in Education Week since 2007. Once an advocate of school choice, testing, and accountability, Ravitch published her influential The Death and Life of the Great American School System in 2010, arguing that these very policies are hurting students, teachers, and public education. As the ambush of public education has become more intense, activism has increased. Rethinking Schools posted the “Not Waiting for Superman” website where critics responded to the myths underlying the corporate-supported film Waiting for Superman and generated ideas for local protests and actions that germinated across the country. When Governor Scott Walker tried to fast-track a bill to strip Wisconsin teachers and other public employees of their bargaining rights, Madison became a center of Wisconsin protest and national solidarity. Civil rights groups have challenged the way market-driven educational policies harm students of color. In 2010, a coalition of groups, including the NAACP, the Lawyers’ Committee for Civil Rights Under Law, and Rainbow/PUSH Coalition, criticized Race to the Top legislation for emphasizing competitive incentives that leave the majority of low-income and students of color behind. It also critiqued the shutting down of low-performing schools, rather than doing more to close gaps in resources and to end racial segregation in schools. The coalition’s report pressed for policy changes because “for too long communities of color have been testing grounds for unproven methods of educational change.” In 2011, the NAACP Legal Defense Fund and FairTest, among others, critiqued NCLB for catalyzing the school-to-prison pipeline. They documented how high-stakes testing and zero-tolerance policies have pushed students out of school into the juvenile and criminal justice systems, with especially severe effects on students of color and students with disabilities. Students have also fought vigorously for their public schools. For example, students in Raza Studies Program in the Tucson High Magnet School chained themselves to the empty chairs belonging to school board members to deter a vote that could close down their culturally relevant and academically successful program. In the spring of 2011, students at the Catherine Ferguson Academy in Detroit, a public school for pregnant students and young mothers, were handcuffed and arrested after sitting down in front of their very successful school to protest its imminent closure. Moving Forward The future holds the hope of new directions in the fight for public education, including more national organizing, growing social justice unionism and assertive public actions. Thousands of educators, parents, students and administrators from across the county marched to keep public schools “public” at the Save Our Schools March Washington, D.C. in July, 2011. Educators committed to principles of social justice unionism, such as those in Los Angeles and Milwaukee, are building coalitions with diverse communities to enlarge a base for awareness and activism. Young people and adults alike, making more bold public protests, are willing to risk arrest to call attention to the injustices that threaten public education. From the local to national level, from individual protests to collective civil disobedience, advocates of public education are developing creative approaches to educate and organize. Since social inequality and privatization also ambush the economy, housing, the health care system and the media, it will take a broad movement to foster the social change that is needed to revive democratic schooling in a democratic society. Bolstered by the many examples in this volume and on the Educational Courage website, we hold out the hope that educators, students and parents can concurrently rise to the occasion by forging strategies for surviving and thriving within the system and also using their individual and collective power to critique and challenge the many policies and practices that undermine public education today. The narratives here show that there’s no one way to resist and that courage, resilience and organization are core values. We hope these accounts show the wide range of possibility for transforming “what is” into “what can be.” Margaret Mead’s famous quote says, “Never doubt that a small group of concerned citizens can make a difference. Indeed, it is the only thing that ever has.” We must begin with a shared conviction that change is possible; we must become informed and work together from a place of solidarity not only to resist but to sustain and create alternative spaces and visions for public education and a democratic society. This book is designed to help us on that journey. Additional Readings and Resources can be found on the Educational Courage website.